High Tea. Afternoon Tea. Tea Parties. Tea Time. Cookie Servers. Single plate or tiered, are becoming popular again, often used at weddings, especially the tiered servers. 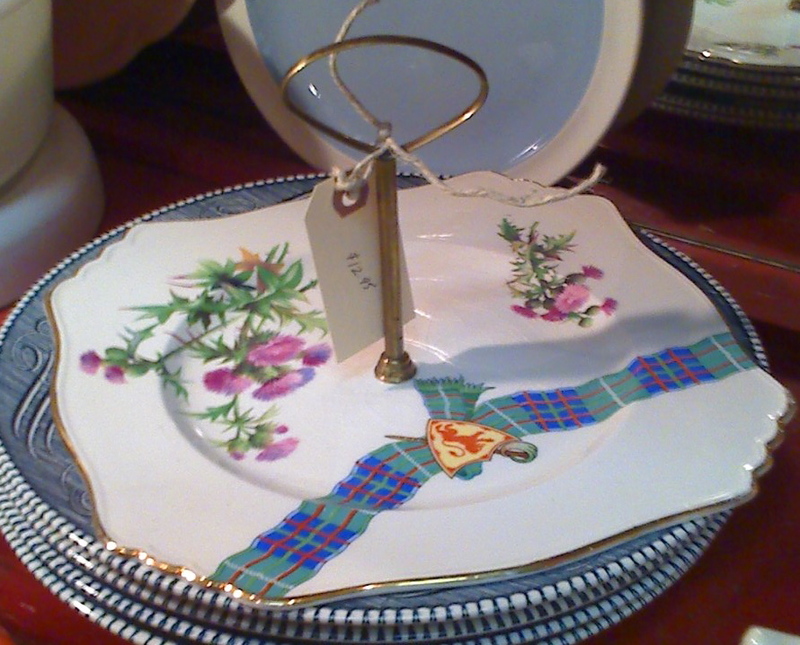 They are found in use at High Teas (for example the Empress in Victoria). 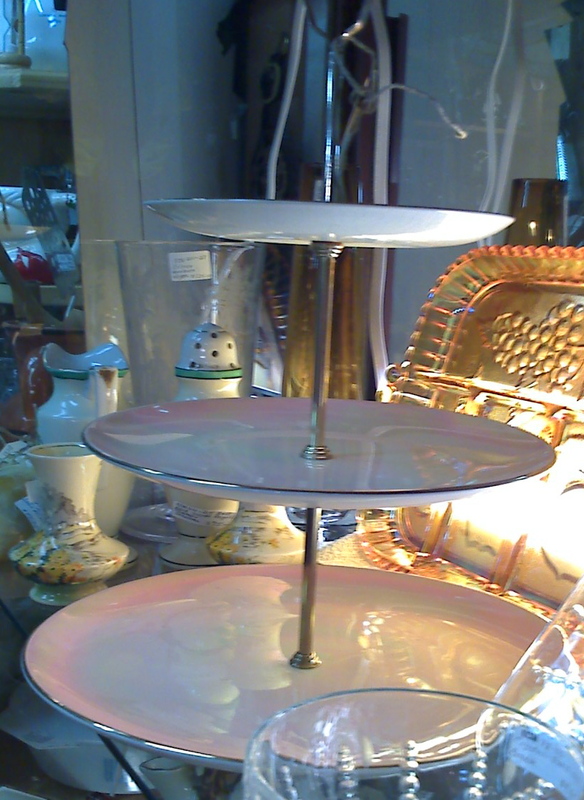 Cupcakes have become a popular change from sliced desserts and look beautiful on tiered serving plates. Specialty cupcakes have become a thriving home and bakery business. I find many single serving plates that are made with a center hole and once had metal handles but, without the handles they are worth nothing. Handles especially multilevel sets with all the necessary parts are not easy to find when out 'thrifting' and are not inexpensive to buy new. When possible a marriage of better quality plate with a handle from a mediocre plate works. If you search 'tiered cookie stands' on google you will see a great many configurations. The Royal Winton Pink tiered trays below were sold before Christmas to a Mother of the Bride. 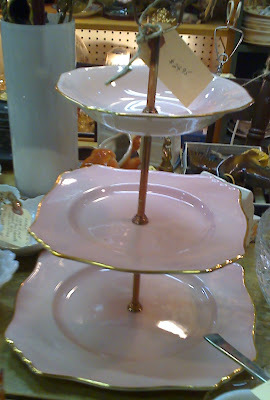 She bought all the tiered serving trays I had for the Bride and Groom's wedding reception. Love your cookie servers. Sometimes I find just the handle and I grab it in case I find a plate with the center hole!!! Love these serving plates! So many pretty patterns. Love the Easter goodies...those bunnies are so sweet. Love spring tablescape goodies. Yard sales will be picking up in your area soon, I'm sure. So nice when you stop by my blog. Thank you. Love your serving trays! I am so glad to see these make a come back!! It's nice to 'meet' you! Those serving plates are wonderful! I'm sure they came in handy for that wedding. I see we are fellow Canadians. I have a son who lives in BC also. Thanks for stopping by my tea party. I am signing up to follow. Enjoy this first week of Spring but then again, you've been enjoyng spring weather much longer than we have here on the east coast.